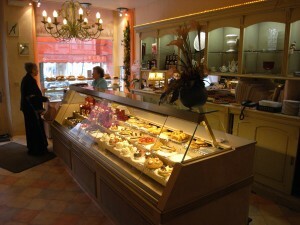 We reluctantly rose at 10 and journeyed on to Spa, a small Belgian town on the way to Germany. After a delicious breakfast of waffles and tea we bid fond ‘A bientôt!’ to Belgium. 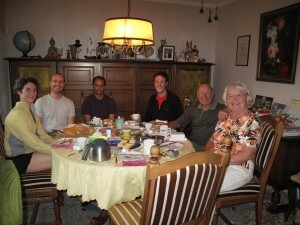 Continuing on to Frankfurt, we were given a warm welcome by Sarah’s friend Marcus and his lovely parents. After a tour of the garden and a pleasant afternoon drinking Marcus’ favorite beer on the porch of the garden house, we headed into the historic town center with Marcus and Corinna for a traditional German meal: sausage, schnitzel, smoked fish, and a regional fresh herb sauce. Coolest of all was the translucent cheese, which Anand mistook alternately for pineapple chunks and pieces of onion, and which tasted like nothing any of us had ever had before. It was smoky, waxy, pickled and tasted a bit musky, kind of like a mild gouda served with a spritz of cologne. Apparently just unwrapping the cheese is a difficult and failure-prone undertaking, and you still have to let it sit for a while before you can eat it. In the morning, Sarah and Anand took an ill-fated jog around town early in the morning and wound up in a neighboring village. Marcus had to fetch them, but eventually everyone was delivered to the breakfast table where Marcus’s family had set a rich spread of bread rolls, homemade jam, apple cheesecake, and boiled eggs housed in little crocheted, hen-shaped egg cozies. CBPG went off to pack its belongings and make some last minute weefee. Before leaving, we went back to say goodbye to Marcus’s parents who said, “Wait, we want to give you some things.” Marcus’s mom had prepared a list of all the counties of Germany and their capitals, so we could learn them on our trip. She gave us a nice bag with Hessen county’s seal on it and some chocolates and throat lozenges inside. Then, best of all, Marcus’s dad brought out a crazy looking quadromonica – like four 8-inch long harmonicas put together in a cross shape – and played us a traditional farewell tune. 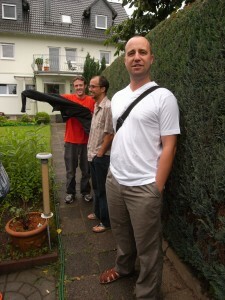 It was the perfect send-off from Germany, and with that, we were ready to head off to Klatovy, Czech Republic!